We trained well together, slowly increasing our mileage each Sunday, running along the canal near our flat. I had a slight recurrence of my knee problems from a few years back, and had to knock back some mileage in February, but it all started to come together before the big day. Due to illness and holiday, neither of us had ran for two weeks prior the event. I’m not sure this is the recommended taper for a half, but it worked out well for us. You’d think that after the logistical nightmare of preparing for a triathlon, packing for a running race would be easy. And you’d be correct. But it fooled me into a false sense of security. Which is a long-winded way of saying that I forgot my Garmin and only realised this as I walked to the start line. I held in the urge to freak out about the lack of Garmin as I dropped off my bag and made my way to the starting pen. After all, it was too late now, so I resigned myself to running “on feel”, and still hoping to come out sub-1:55. 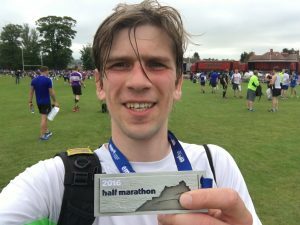 This is somewhat after the fact, as I try to write the post some months after the race, but here is my best recollection of how it went. Without the watch, I was very pleased that we had checked out the complete course by bike a few weeks earlier, as at least I knew what was coming up, and could try to figure out how far through we were. The suggestion to cycle the course came from our friend Celine, so I’m grateful to her. Without the watch, I kept a good eye out for mile markers and saw nearly all of them – this was still useless without knowing the time, but at least I could mentally prepare for how far through/how much was remaining. On that note, I was quite surprised by how few clocks there were out on course – just one at the 10km mark at Portobello beach. The run out to the beach was a strange one. It starts out quite interesting and iconic, running past the Scottish Parliament and Our Dynamic Earth, into Holyrood Park, in the shadow of Arthur’s Seat. However, the race then turns into a residential area and an industrial area before finally making it to the promenade. These areas were relatively sparse in support, although this was more than made up for along the waterfront, with many people out to support. A few very enthusiastic supporters were also handing out chocolate and jelly babies to competitors! From Portobello, we made our way over to Musselburgh Racecourse. At this point (~9 mile) I decided to take on a gel from the aid station, just to make sure I could make it through to 13.1 at a steady pace. 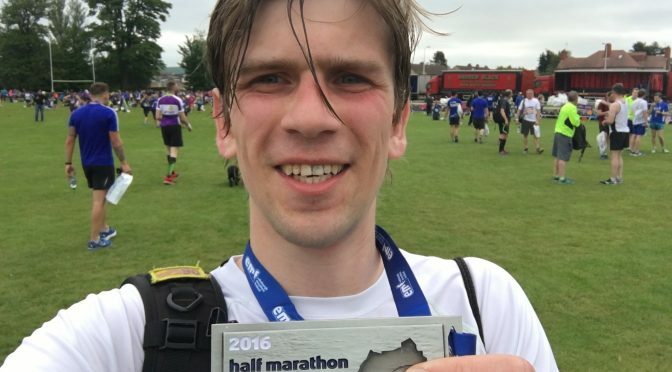 I’m glad I did, but it probably could have been taken on a bit earlier, as the final two miles were a bit of a blur as my body was feeling the effort, but I recovered quite quickly after the race – I think the sugar hit my muscles too late. That last section after the racecourse is an out-and-back, so I was very pleased that even in my confused, low blood sugar state, I was still able to spot and high five my girlfriend coming the other way. Sweaty selfie with my medal! My target time was 1:55, with a stretch time of 1:50 that I thought might be possible. Of course, having no watch, the first I knew of my time was when I made it to the bag drop and grabbed my phone to see the results text! (And take a post-race selfie!). I also managed to get back to finish line to watch my girlfriend run the final few hundred metres, which was a nice extra. Post-race, the only frustration is transport. As the race is an A-to-B, running out of the city centre, you then have to try and get back to Edinburgh. I’d pre-bought bus tickets, but the bus station is a good 20 min walk from the finish zone – the last thing you want when you’ve laid it all out there for the race. There was then a large queue to actually get a bus, with very little signage or instruction. So, I’m not sure that I’ll be doing the race again. It was a great to do, and with relatively little pressure as it was so close. But the course is not particularly scenic as you run out the city, and it is then a pain to get back from. I think there are plenty of equally flat and more picturesque courses around. I would certainly like to go back to Berlin and try again!